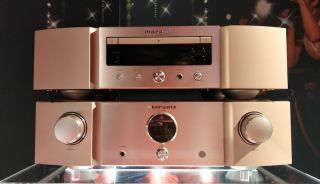 Marantz announces limited edition KI Ruby SACD/CD player and integrated amp | What Hi-Fi? The SA-KI Ruby and PM-KI Ruby celebrate Brand Ambassador Ken Ishiwata’s 40th anniversary with the company. Couples celebrating their ruby (40-year) wedding anniversary might renew their wedding vows or throw a ruby red-themed party, while the very few hardy folk that make it to 40 years in one company's employment may be presented with a plaque or silver-plated cutlery set. Well, Ken Ishiwata (who has now been a huge part of Marantz’s designing and engineering for four decades) has been able to put his sonic stamp (and indeed his signature) on two brand-new, limited-edition Marantz products to mark the occasion. The PM-KI Ruby integrated amplifier and SA-KI Ruby SACD/CD player follow the last special edition Ishiwata anniversary products – the KI Pearl Lite amplifier and SACD/CD player – introduced in 2008 in celebration of his – you guessed it – 30th anniversary. Both components will have a limited, one-off run this year of 500 each, with the first 200 buyers of both promised matching serial numbers. The 100-watt-per-channel PM-KI Ruby uses a discrete two-stage design with separate power supplies for the pre-amplifier and power amplifier sections, and takes a page out the flagship PM-10 amplifier’s book by featuring a moving-magnet and moving-coil phono stage with Marantz’s new phono EQ circuitry design. Building on its analogue-only connectivity are six RCA inputs and two outputs, along with a 6.3mm front panel headphone output, while Marantz’s proprietary HDAM (Hyper Dynamic Amplifier Module) technology and copper-plated chassis are familiar inclusions on the spec sheet. The more unfamiliar finishing touch: his signature laser-etched onto the top of the aluminium front panel. The SA-KI Ruby SACD/CD player, meanwhile, features a new disc mechanism, the ‘SACDM-3’, for SACD, CD and CD-ROM playback. Again it draws on company’s flagship machine, the SA-10, but unlike the PM-KI Ruby incorporates digital connectivity. There’s an asynchronous USB input capable of handling PCM files up to 32bit/384kHz as well as DSD 11.2MHz, with all files being upconverted to DSD for playback. Optical and coaxial inputs and outputs, and a USB type-A input, are also included on the rear panel. The PM-KI Ruby integrated amplifier and SA-KI Ruby SACD/CD player will be available in September, priced at £3500 each.